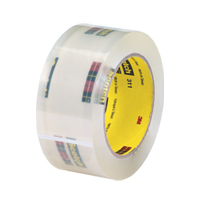 Super strong pressure sensitive polypropylene tape for economical, repetitive volume packaging. 2" wide and available in rolls of 55 or 110 yards. Features a conformable backing and consistent adhesive system that will not peel, crack or dry out. Polypropylene backing with hot melt rubber adhesive.